Do you have your garden in yet? My dear hubby put ours in about a month ago and ever since then we’ve had one battle after another with critters! So far, a cute and little but very bad bunny feasted on some tomato and pepper plants and an armadillo lumbered through my herb bed breaking off three of my basil plants. Upcoming battles to come include squirrels taking bites out of tomatoes and raccoons stealing eggplant. I’d love to hear your tips on how to manage these critters. I keep trying to talk my husband into installing an electric fence, but he’s too nice of a guy to do that so I guess we will battle on! 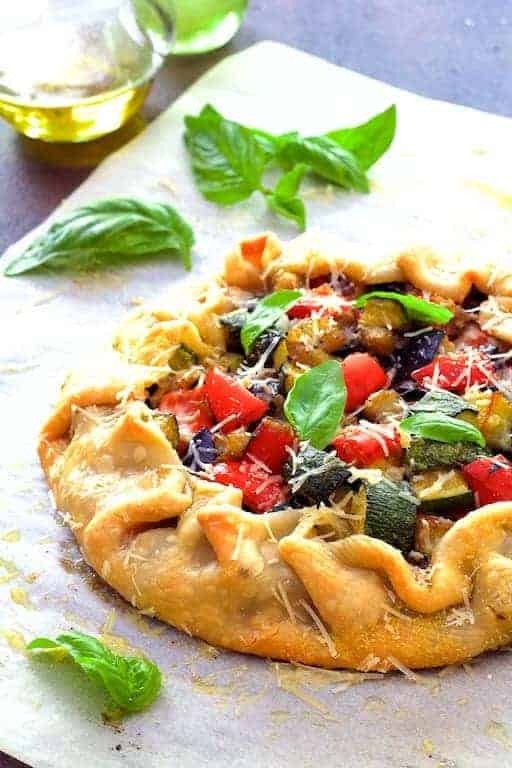 This Mediterranean Roasted Vegetable Galette is a lovely way to enjoy some future garden abundance….. If the wildlife around you will allow it! Different from a quiche or tart, a galette does not require a custard filling or any special pans. It’s simply a rustic, versatile free form tart that can be filled with almost anything. This version has eggplant, zucchini, red bell peppers and tomatoes. Begin by cutting a small eggplant into cubes and placing it in a colander. Toss with a generous amount of salt and allow it to drain for about 30 minutes. Peeling the eggplant is optional, however, I prefer to leave the skin on because it contains a ton of antioxidants. Salting the eggplant will help remove some of the mildly bitter taste it tends to have. I don’t always salt and drain eggplant because I like that flavor. For this dish, salting will soften it a bit so that when the vegetables are roasted, they all cook evenly. If you’re salt-sensitive, skip that step and just start the eggplant 5 or 10 minutes ahead of the other vegetables. Bake the galette on parchment paper which has been sprinkled with cornmeal to keep the pastry from sticking to your baking sheet. 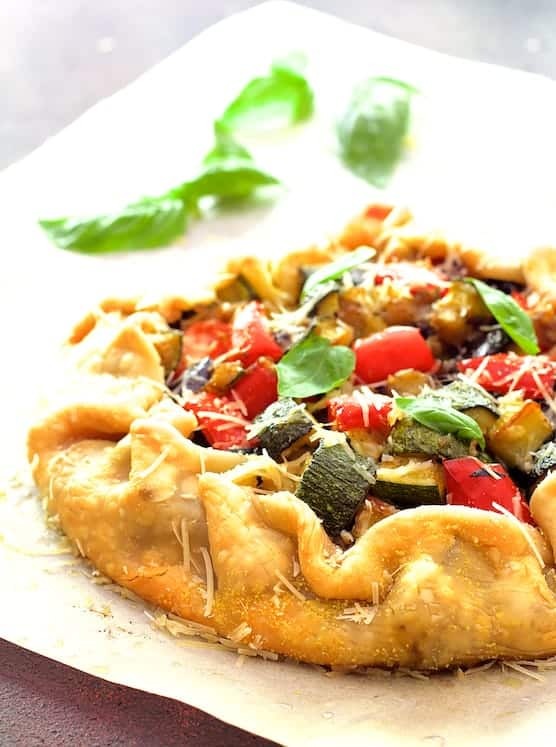 This Mediterranean-inspired roasted vegetable galette is elegant yet fuss-free! This looks fantastic! I’m getting a bit tired of our stand-by, ratatouille over noodles. Recently I’ve been making homemade pizza dough. The dough for the galette can’t be that hard. I wonder if you’ve researched the galette pastry recipe?